Disclaimer: Kia provided me with a 2012 Kia Rio SX sedan (not the hatchback) for a week to review and treat “as I would treat my regular vehicle”. They paid for insurance and the first tank of gas (which I didn’t use all of anyway). They did not pay me in any way, nor did they guide me on how to write my review. When did compact sub-compact cars become the size of mid-size or even full-size cars? When did cars start costing $13k and more (unless you want a completely stripped down car)? However, as a funny anecdote, this past weekend I told a wealthy friend about the test drive and he exclaimed, in surprise, “they make cars under $20,000 still?? ?” and he was totally serious. This guy owns a Mercedes SL550 and GL-class and apparently is out of touch with us normal people. So enters the 2012 Kia Rio (the 2013 is out, with a couple more features and at a few more dollars), fully redesigned to fit more with the corporate design language and share architecture with its Hyundai platform mate, the Accent (although it looks closer to the Elantra). But in no way can I consider this car a “compact sub-compact ” when it fits 5 comfortably and has a trunk that can swallow a few small countries. But it gets 30 city/40 hwy, so it definitely meets the fuel economy of a compact sub-compact car. So how do I go about doing my first “Clever Dude” auto review? Well, I have to figure out my audience (you). What do you care about? Well, from past articles on cars, I think you care about features, affordability, “bang for the buck” and functionality. While most car magazines focus solely on driving dynamics, 0-60 times and driving through a mountain slalom of billy goats, I’m going to stick with “WOULD I BUY THIS CAR?”. Keep in mind, though, that just because I tend to have “stupid cars” as some of you think (Honda Ridgeline, MINI Cooper S), I love cars and I can appreciate cars that are more utilitarian than quirky, or are more commuter than luxury. And that last part is where the 2012 Kia Rio comes in. 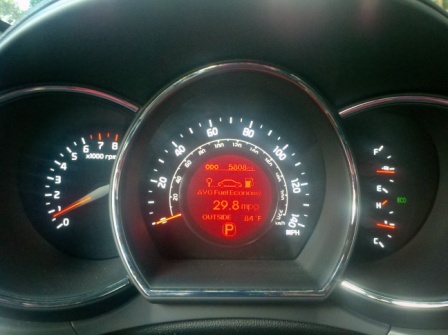 What IS the 2012 Kia Rio SX? Now when it comes to first impressions, this car had me at Hello. I think Kia is going in the right direction with styling, both inside and out, compared to its competition, and the Rio is miles away from its predecessors. Before, it was just a Korean car with a good warranty (which you had to use often), but now Kia makes class-leading models that offer features that only bigger, more expensive cars deliver. Things like power folding side mirrors, heated seats, soft-touch everything (it means stuff doesn’t rattle and surfaces feel pretty), infotainment systems and more. Above: Note the on-screen button for Sirius Traffic (additional cost after the first 90 days). Very helpful in planning your commute! 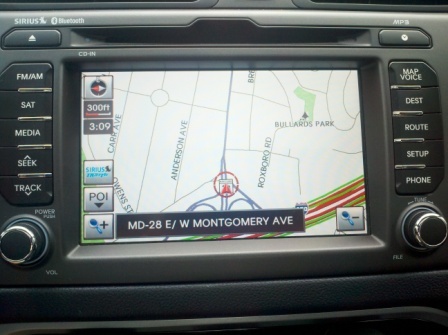 Definitely one of the best in-car navigation units I’ve tested. 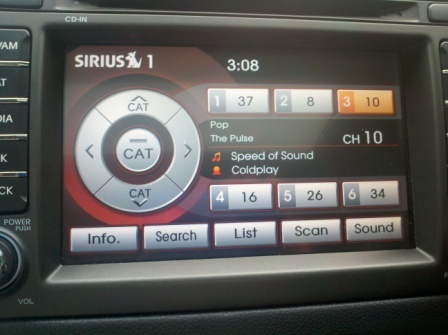 Below: A shot of the Sirius interface. 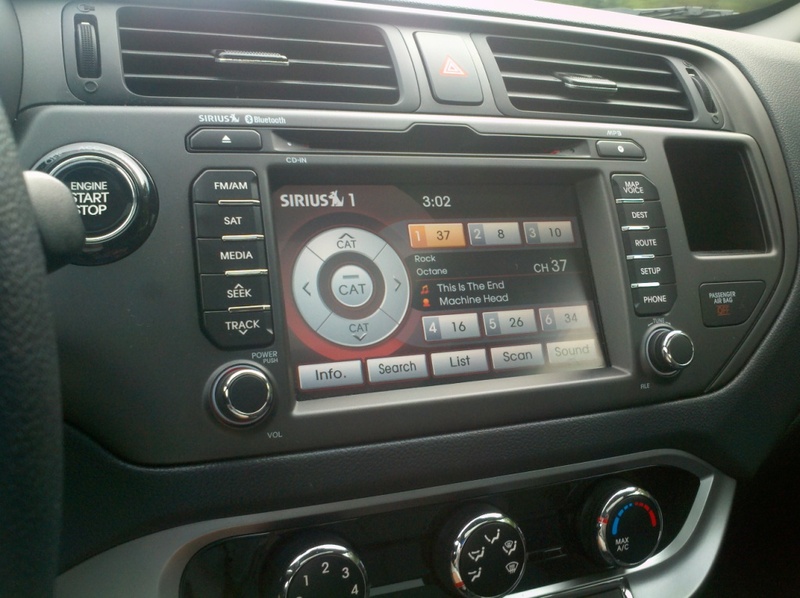 The regular radio and iPod interfaces look similar. I didn’t show the Bluetooth streaming of Pandora from my phone which was one of the first things I tried before I even drove the car. Seamless until you accidentally switch to another media source and it drops the connection and you have to kill Pandora and start again. Those are just a few of the features that the SX adds to the base model that already includes an auxiliary jack, USB port (but you need a special cable to control your iPod from the stereo/steering wheel which I think is a necessity so you’re not messing around with the device while driving), and safety features and airbags out the yinyang. But there was one safety feature that was missing: A SPARE TIRE! This is not unique in this segment as car manufacturers are ditching the spare tire for a much lighter (and cheaper) “patch kit” that also helps in bumping up fuel economy by a few fractions. 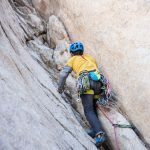 However, when your sidewall ruptures or the rim is bent, you’re stranded. If there’s an option to check a box for a spare, get it, or just go to a tire shop and buy one. Even as a man, I wouldn’t want to rely just on a can of fix-a-flat and compressed air, much less let my wife out on a long trip with no spare (her MINI Cooper has run-flat tires that have already come in handy once). I will also complain that while having voice-activated controls for the infotainment system is excellent at this price range, you really need to know the commands to use, and even then, it took a few times for the car to understand me say “Call Wife” (which is my wife’s phonebook entry). It was much easier to just use the touchscreen for everything, except it took your eyes off the road. I’m sure it’s something you would get used to. And the bluetooth phone conversations were good when the vents weren’t blowing, but during one conversation I had with my wife while crawling in traffic with no ventilation on and the windows closed, my wife asked if I had windows open or something. Could have been my phone, the bluetooth or the car. Don’t know, but again, nice feature in this price range. So now we’re working closer to justifying the pricetag a bit better. But still, over 20 large for a compact sub-compact car? As a 5’10”, 200lb (formerly 230lb, thank you) man, my body will fit the seats and ergonomics differently than, say, my 5’1″, 95lb wife or any of you. I was the only one allowed to drive it, and I didn’t have her sit in the driver’s seat, but I did have a friend who is 6′ and DOUBLE my weight (last we talked about it) sit in the driver’s seat and found it surprisingly accommodating. He currently drives a VW Passat TDI (that he loves and I advised him to buy) and would probably hate anything smaller as a daily driver, but he wasn’t uncomfortable in it. The steering wheel goes up and down, but also telescopes, which even my truck doesn’t do (c’mon Honda!). The seat adjusts forward, backward, reclines and has a manual jack to make the seat cushion go up and down to fit your height needs. I like to ride high in my truck, but low in cars, but I found that if I have the seat down all the way, the steering wheel and the center console armrest were too high, so I had to jack up the seat a couple notches. No big deal. I have back problems, and I require all my cars to have lumbar support, even though my wife disables it when she drives. The Rio didn’t have an optional lumbar support built into the seat, which was disappointing, but it did have a little bit of extra cushion to simulate a little support, so that would help on long trips. 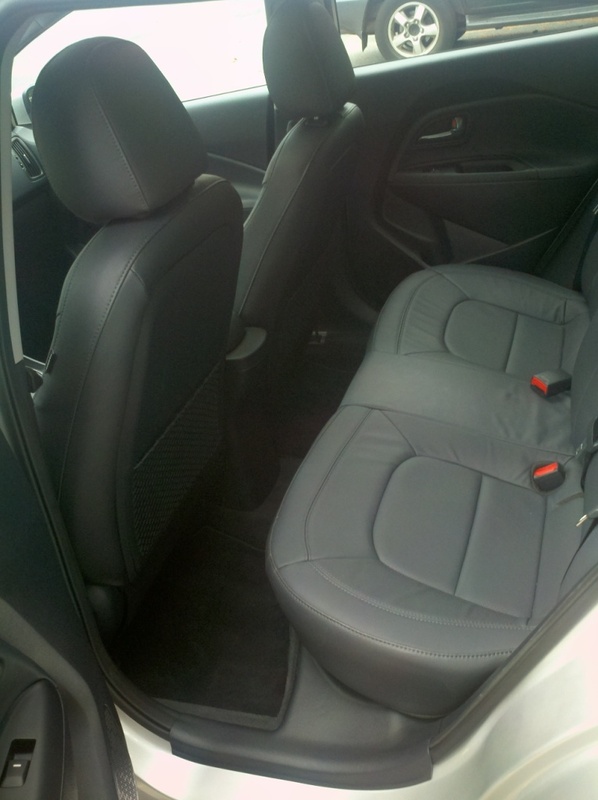 The seats were firm yet supple,so I have no doubts we could drive this hundreds of miles without getting tired. 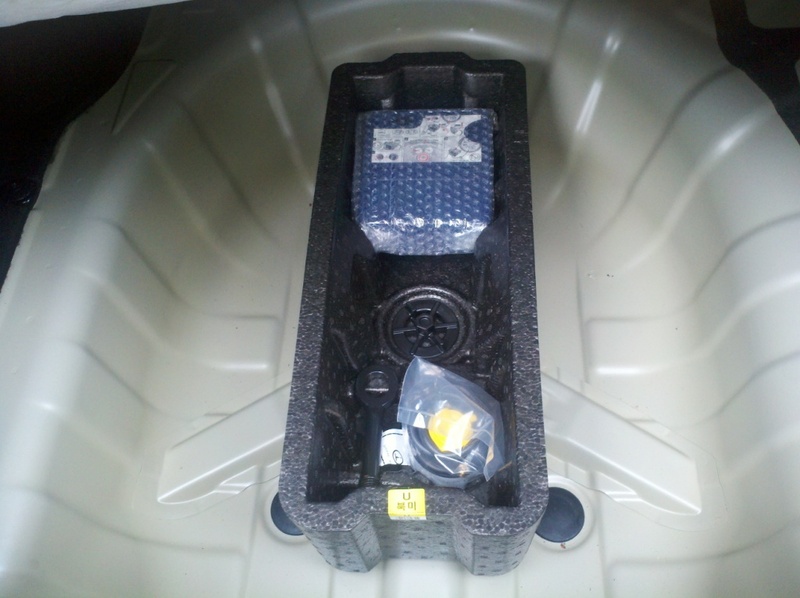 I was also pleased that the driver footwell had a “dead pedal”, which is place to put your left foot while driving. But let’s talk about passengers a bit. First, the front. My wife’s seat (front right) had no option to adjust the height. Therefore, more than half of her view was the dashboard. Anyone who gets car sick or just wants to see where you’re going will need to bring an extra cushion, which I don’t advise anyway due to it potentially sliding out from under you in an accident and messing with the seatbelt/airbags saving you properly. So no, my wife would not like this as a long-distance commuter. Now the back seat. With my seat in my normal driving position, I had an inch of knee room to spare. 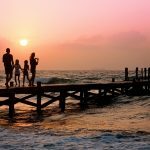 Four adults can easily fit in the car and be comfortable for a long trip. EXCEPT, we had a third passenger ride with us around town (she gets car sick) and I asked her opinion on the seat. She’s short like my wife, and found that the slope of the window upwards blocked her visibility out the sides. Strike one against the styling impacting comfort/functionality. Strike two comes for the driver seeing out the front of the car. I could see out just find, but in no way possible could I see any part of the front hood to know how close I was to hitting a curb, wall, another vehicle when parking. Luckily I didn’t, but adding in some front sensors would help the driver. However, not is all bad in the front. The side mirrors are moved back further to allow for small windows and a thinner “A pillar” (the part of the frame around the front windshield that normally blocks your view of people crossing the street, etc.). I’m not sure if it was moved back for styling, functionality, safety or what, but it did bring more light in, make the front cabin feel more airy and perhaps give more visibility, but I didn’t have an opportunity to test (sorry, no people ran out in front of the car). I will also complain right now about the extra low plastic apron mounted behind the front bumper. Meant for aerodynamics and protecting the underside of your car, it would always catch on parking lot curb stops. Maybe I’m just used to driving my truck, but I think Kia may have made it lower to eek out a few fractions of an MPG. Note: In the image below, I have my seat back to where I like it, but it can go back further, which would definitely cramp the legs of adults in the back. I’ve heard that it’s a very tight fit for baby seats facing rearward unless the front seat (most likely passenger) is all the way forward. Definitely take your car seats to the dealer to try them out! Also, this photo is only at a slight angle, so you can see some of the upward slant the passenger was complaining about. Strike three on styling is when looking out the rear. The large rearview mirror is more than half-filled with the back seat headrests and space below the rear window, with just a sliver of window to view. Therefore, the added rear camera is a requirement; otherwise you would have NO idea if you’re going to back over a child, a drunk man, or a building. Again, style over functionality, but many automakers are making this swoopy design that looks good from the outside, adds more headroom and trunk space while hiding the height in the design, but takes away from visibility greatly. You just have to be more vigilant when backing up or changing lanes (to know if an idiot sprung out from behind you to pass you). But again, something I could live with daily as long as I had that rear camera. However, I could back into parking spots in a breeze even without the camera, except for the last few inches to know if I was fully in or about to hit something. 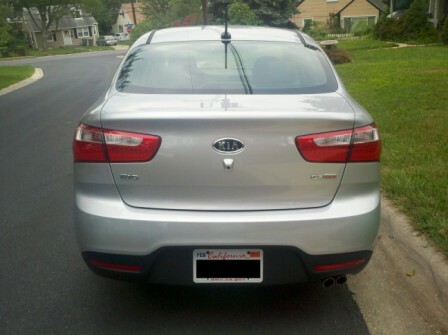 Below: Note the camera below the Kia logo, but what you can’t see are the nicely integrated LED tail lamps that are bright as heck at night. Really great rear styling with features like LED lights that you don’t get in this class elsewhere (often at least). Now about the drive. It only has 138hp and 123lb-ft of torque, which would be great for a car about 20 years ago. However, with the 6-speed automatic transmission and light weight helps it move around town and pass on the highway just fine. You’re NOT going to win any drag races and driving up hills (especially passing) will be straining. 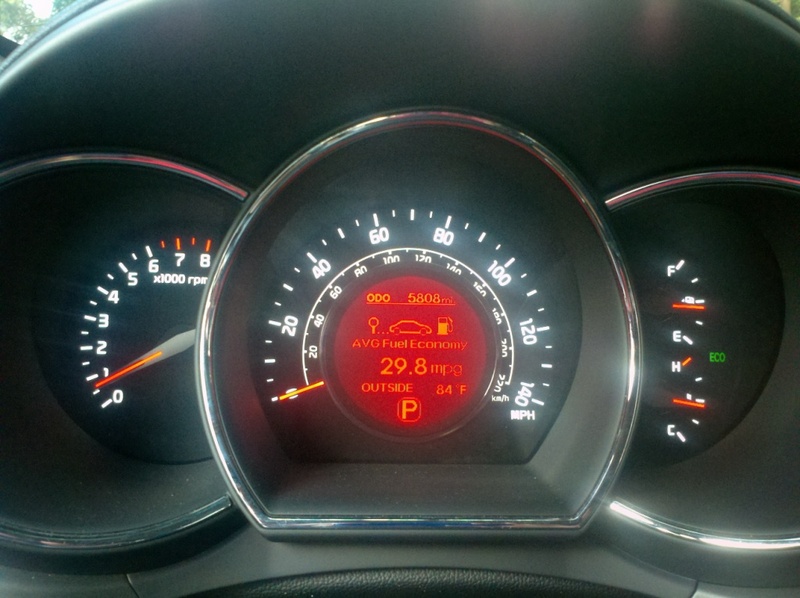 However, I got almost 42mpg on a 50 mile highway loop, with about 10 miles of city driving. Granted, since I have a heavy right foot, I put it on cruise control at the speed limit or 5 over. Plus, it was on the highway during little traffic. I would bet, though, that a hypermiler could get close to 50mpg if not more. But at the end of the day, the final number after a couple hundred miles of driving was 29.8mpg. Above: After a 50 mile highway loop. So it can move itself out of its own way, which is good for a car of its type, but can it stop? Surprisingly, the car has disc brakes on all four wheels, when much of the competition have drum brakes in the back. One automobile magazine measured the braking at 119 feet, which is pretty darn good. The brake pedal was just right, not mushy or jerky, and stopped the car beautifully without lunging. Oh, and before I forget, I want to complain about the stupidity in using red on black for instrumentation. Mazda does it somewhat ok, but I’ve now driven both the Kia Sportage and Rio, and in both, the screens have been washed out by the sun (especially the stereo on the Sportage). Even the navigation screen on the Rio was half-blocked by sun one time, which is why bigger vehicles have a slight advantage because they can recess the screen a bit to avoid glare. But on a good note, I did also want to mention the ECO button. You can turn the ECO mode on and off and since it’s a “clicky button”, not just a digital control, it will stay on any time you turn on/off the car until you depress it. I drove in ECO mode the entire time except a couple times I wanted to test acceleration on the highway. 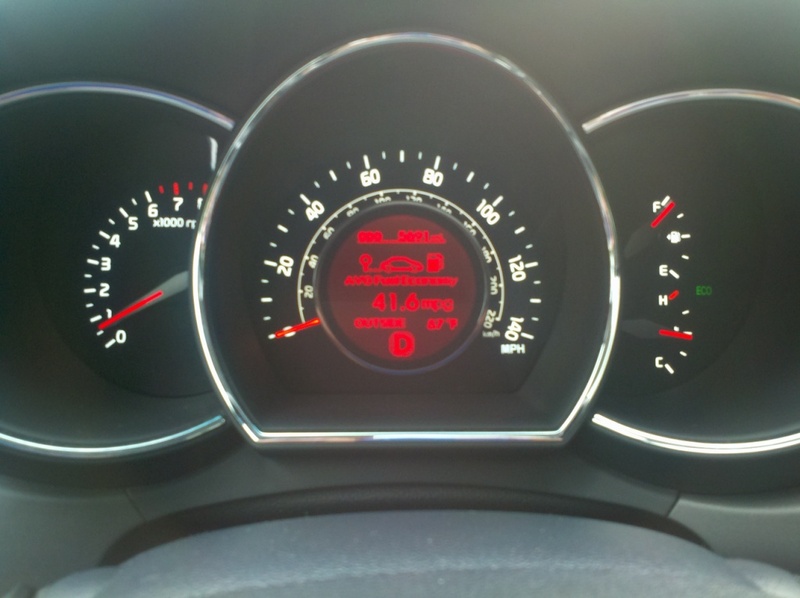 I noticed different gearing (more power and downshifting sooner when not in ECO mode), but when merging onto the D.C. Beltway, I had no problem while still in ECO mode. You’ll get the power you need, just a little bit later. You just need to keep that in mind and plan for it. One strange thing about the trims though is that while you can get the EX with ECO plus “Idle Stop and Go (ISG)”, you can only get the plain old ECO in the SX. Why would a higher trim not offer this fuel-saving capability? Ok, so it goes, stops, costs $20k, and so forth. But how does it stack up against competition. This is the hardest part of a car review because 1) I haven’t driven the competition, 2) everyone’s tastes are different and 3) it takes so long to analyze all the numbers and comparisons. Basically, though, the other cars in this class have about the same power, similar fuel economy and starting price. However, some cars (Honda Fit, if you’re comparing the hatch version) have more space, and others have better driving dynamics (Chevrolet Sonic, Ford Fiesta). But people don’t buy compact sub-compact cars for a racetrack. They buy them for the low price, fuel economy, as starter cars for kids or commuter cars. So I won’t hold it against the Rio that it takes almost 10 seconds to hit 60mph. The Kia Rio does exactly what it was meant to do and more. 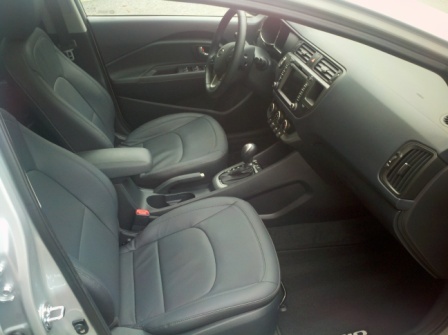 It provides amenities that you can’t even get in other cars in its class at barely more in price. It’s comfortable, efficient and I would take it as a daily commuter if I was in the market. But I also want to point out that if you try to configure similar features in competitors, you will spend up to $2000 or so MORE, like in the Ford Fiesta. But would I get the SX model? Well, there’s pros and cons I would have to consider. If I were at my old job driving 60 miles every day, I would love to have the Sirius/XM radio, aux/USB jack, traffic notifications and integrated bluetooth (including the ability to stream media from my phone like Pandora). 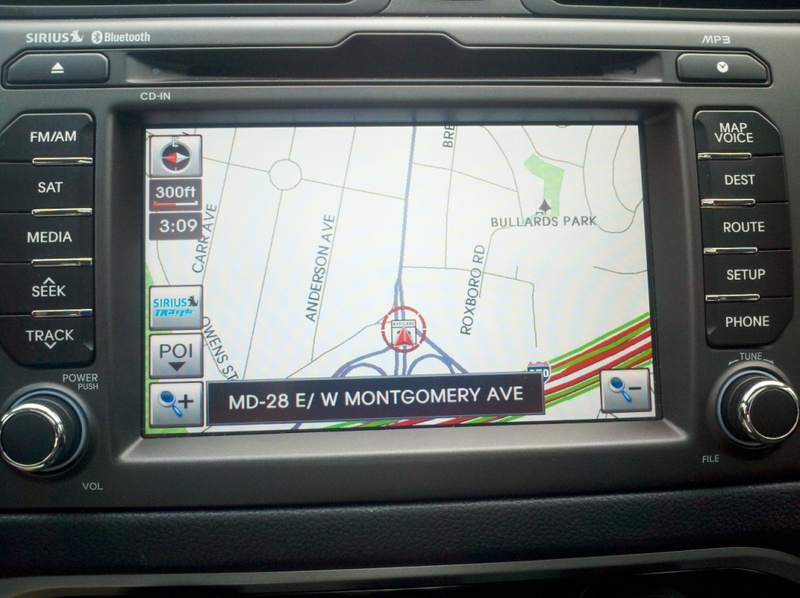 But here’s the catch with any vehicle when you’re considering the upgrade to a navigation system. Everyone knows they can buy an amazing navigation device (Garmin, TomTom, etc.) with live traffic and even bluetooth phone connectivity for well under $2200. You can get a rear camera installed for a couple hundred. You can get satellite radio installed for a couple hundred, or even less if you go over an FM band (annoying as heck though), but in the end, does the convenience of getting it all at once outweigh the hundreds you could save getting the features piecemeal? 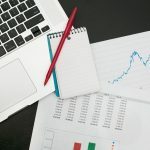 If you’re the type that just looks at the payment, which you should NEVER do, you could justify that it’s just a few dollars more over the course of a 60-72 month loan. For me, I want this stuff included in my next vehicle, but I find it hard to check a box for $2,200 when I know I can get each piece cheaper if I have the patience. So who is this car for? The Kia Rio is for a much wider audience than the specific SX model I had, so I’ll focus on just the SX. The SX is for commuters who want luxury features and comfort, with good fuel economy, excellent safety features and warranty, good styling (subjective) and good enough handling/braking. If you’re looking at new cars only, then you’re locked into about the same pricing across the board, but there’s always the used market. However, economical cars are going for a premium right now, and you won’t get these features, so you may be better off buying new. If I get a chance to drive the competition, I might revise some of these numbers, but for now, I’ll say Kia did a great job, but I’m just disappointed at the market in general for costing so much for a well-equipped compact SUB-COMPACT car. They’re not making big margins on these cars, so I don’t expect you to haggle down the price much, but if you’re in the market, I highly suggest trying out the Kia Rio SX, even if you’re looking at models one size bigger. You might get what you want in a size you like for thousands less! Did they give you a top of the line model? With the touch screen and everything it seems like a good deal with all of the features. 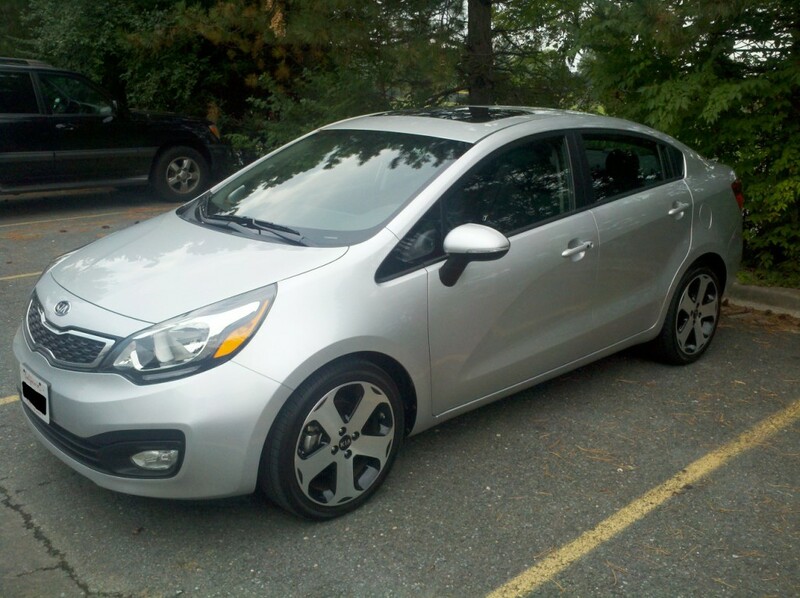 @Yes, this was the fully-loaded Kia Rio with all the bells and whistles. 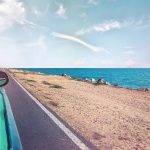 For a new car, and when you’re comparing it to others on the market, it is a great deal for what you’re getting. But then again, you can get the same or more for less in the used market, but you take on more risk and more work to get it.